Easter is coming! It’s time to decide what the Easter Bunny will bring your little ones! Of course, we all know that as parents of children with food allergies, this is no easy feat, what with all the allergen warnings on those darn bunnies. Depending on the allergies you manage, it can be next to impossible to find safe chocolate at your local store. You might think this is out of your league, but it really isn’t too difficult. If you can follow basic directions for melting chocolate, you can make a simple bunny or lollipop. If you’ve got a little more time, you can make a bunny from a two-sided mold. And if you want to get fancy, you can make your own SAFE white chocolate and even add colored accents to your chocolates. Ready? Let’s get started! Safe chocolate for your family. Some possibilities are: Enjoy Life Chocolate Chips (for a dark or semi-sweet bunny); Enjoy Life boom CHOCO boom Ricemilk Chocolate Bars for “milk” chocolate; bars and chips from Pascha Chocolate. Or you make your own white chocolate. Before you begin, make sure there’s space in your freezer for your mold. 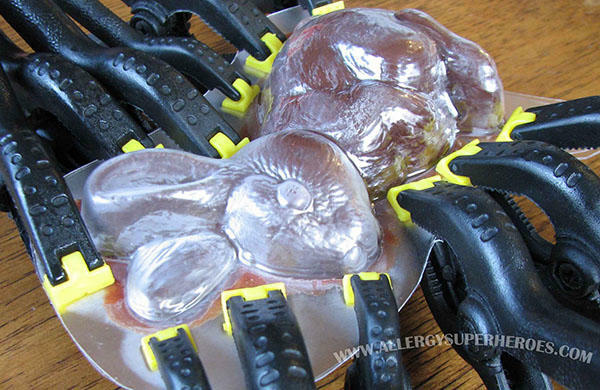 If using a flexible mold, place it on a cookie sheet and make sure you have space for that, too. Make sure it will stay level in the freezer. If your chocolate comes in bars or chunks, chop it into roughly chip-sized pieces. Use a serrated knife to shave down the edge of your bar, and then break any large pieces into smaller ones. You don’t need to chop if you’re starting with chips. Now you want to melt and temper your chocolate. Tempering is an important step in making chocolate; it encourages the fat crystals to “line up” in a way that looks pretty (meaning it has a nice shine and doesn’t “bloom”) and also gives it a nice “snap” when you break it. The chocolate you have is already tempered, but it will lose that when it melts. The science is complicated, but there’s an easy way to do it. Place most of your chocolate (3/4 to 7/8 of it) into a microwave-safe bowl, leaving the rest out for later. Heat your chocolate on 50% power for 15 seconds. Stir, let it sit for a minute, and stir again. Then repeat a good 10-15 times. It is a bit slow, but you don’t want to rush the process. At first it won’t seem like much is happening, but the chocolate will melt, and you won’t burn it this way. Once your chocolate is all the way melted, add your reserved chocolate to the bowl and start stirring. What you’re doing is “seeding” the chocolate. You’re telling the melted chocolate “here’s a blueprint for how you want your fat crystals to line up.” The new chocolate also cools the melted chocolate, which is part of the tempering process. If the new chocolate doesn’t all melt you can heat it a little more, but do it for 5 second intervals at 50% power. Don’t overdo it or you’ll lose the “seed.” As soon as all the chocolate is smooth, you’re ready to pour. You can use a spoon to fill your molds, particularly if you’re using a flat mold, but I like the control of a piping bag. I don’t do anything fancy—just a plain ziplock bag opened into a mug. Once full, snip off the corner. 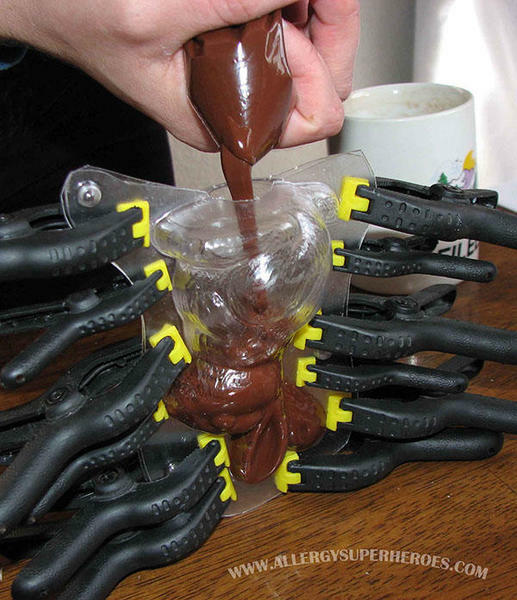 Carefully pipe the chocolate into your molds. If you’re using a larger mold, stop when it’s halfway full and gently tap the mold on the table a few times to encourage air bubbles to rise to the surface. Then fill the mold the rest of the way and tap some more. If you’re making lollies, insert a stick into the cavity and turn it so it gets fully coated with chocolate. Don’t rush, but don’t go too slow either. The ears didn’t come out right on my first bunnies because the chocolate was too hard by the time I filled them. Carefully move your mold to the freezer. It will only need 5-15 minutes for a small or thin mold, 20-30 minutes for medium thickness, and 45 minutes to 1 hour for a thick, solid bunny. It’s ready if you can press on the back/bottom of the chocolate and it doesn’t give. This is NOT something you want to place in the freezer and forget about—you don’t want it getting cold enough to attract condensation. Water is the enemy of chocolate. If you’re making a two-sided mold, the melting/tempering process is the same. You’ll buy your mold flat and will need a sturdy pair of scissors or shears to cut out the pieces. Leave 1/2 inch of flat plastic on all the sides of your mold EXCEPT the bottom. Cut the bottom right up to the mold, and make a semicircular hole in the bottom of both halves, so that you’ll have a 1/2 to 3/4 inch hole in the bottom of the mold when both halves are together. Carefully move your mold to the freezer, keeping the bunny’s bottom up. Prop the mold up with other freezer items to hold this position as it hardens. Regardless of mold shape or size, the chocolate will “pull back” from the mold when it is ready. The mold will have a “frosty” look to it, as there will be a tiny bit of air between the mold and the chocolate. Unclamp the mold (if necessary) and remove the top piece. Then carefully turn the mold over and in many cases the chocolate will fall right out into your hand. If it sticks, gently flex the mold until the chocolate pops out. If too much chocolate seeped into the seam of a two-piece mold, or if you overfilled a flat mold, you can easily correct this once the chocolate is cool. 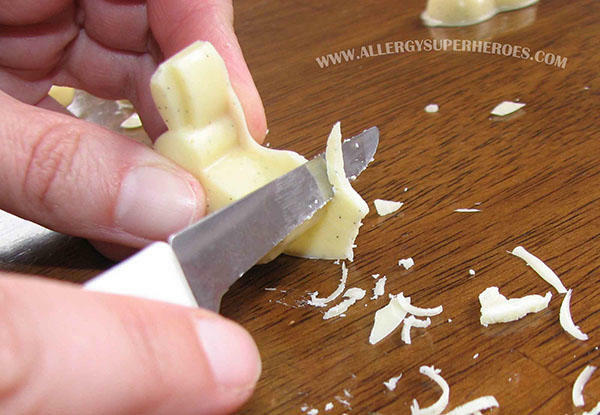 Use a paring knife to gently trim away any excess chocolate. Chocolate is very sensitive to the heat of your hand though, so run your hands under cold water before handling for an extended period. You can even use a paper towel as an insulating layer between you and the chocolate. If you have a bunny or other shape that needs to stand up but the bottom isn’t flat, this is easily fixed. Place a cookie sheet on your stovetop and turn the burner on low. Once it’s warm, stand your bunny on the cookie sheet and rub it back and forth a few times to flatten the bottom. Stand it on parchment or freezer paper for a few minutes to re-harden. One of my bunnies bloomed, I’m not sure why. (The whitish stuff on the leftmost bunny is either sugar or fat that is separating from the bunny.) I probably heated that batch of chocolate too much when the seed chocolate wasn’t melting. Remember to be gentle with your chocolate! But you know the beauty of this? I can just melt him down again, properly temper him, and make him again before Easter arrives. You will have a beautiful assortment of chocolates that you know is safe for your kiddo, because you made them yourself. Comment here with pictures of your creations. I'd love to see what the Easter Bunny brings! Eileen Rhoadarmer will never own a small purse, as she carries epinephrine, Benadryl, and inhalers for three people (herself included.) 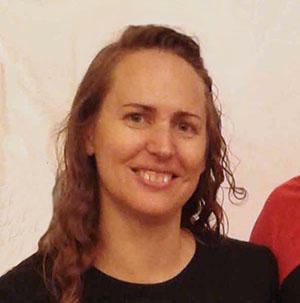 This life led her to co-create Allergy Superheroes, an empowering line of allergy awareness gear to protect allergic superheroes when they’re saving the world on their own. She blogs about food, allergies, and life at 2nd Gen Allergy Mom. Her KFA username is 2ndGenAllergyMom. 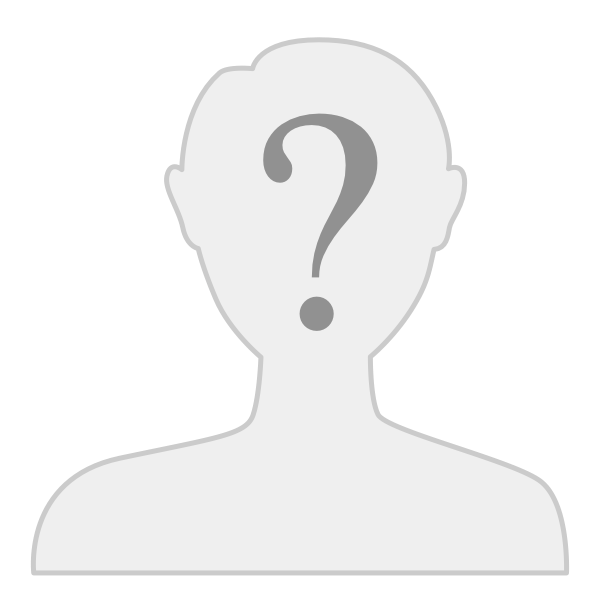 Kids With Food Allergies (KFA) invites authors to contribute guest blogs. In return, we link to their websites or blogs. These links are not an endorsement or sponsorship of content on these third-party sites. For more information, please refer to our terms of service. @Amy DiElsi What did you end up making for Easter? Hi @makadela! I hope you have fun with this! I was going to suggest making a hollow bunny as per instructions above, poking a hole in the bottom to pipe in a filling, and then covering the hole with more melted chocolate. @Kathy P's idea will probably work better, but this might work for sophisticated shapes. We'd love to hear how it works, and see what you create! Don't forget you can add pictures in the comments! cover with melted chocolate. Tap again and stick in the freezer to set. Cool! My chocolate coins started melting when the boys handled them (prob b/c i added coconut oil). Will follow these melting instructions instead! Any idea on how to make a stuffed bunny? My boys love Sneaky Chef No Nut Butter - would like to fill their bunny w/ that. Thanks. Hi Amy, I would probably make them a week or two before Easter--more like two if you think you might need to melt a few down and try again. But make sure you plan enough time that your kiddo will be unable to stumble upon you in the kitchen. 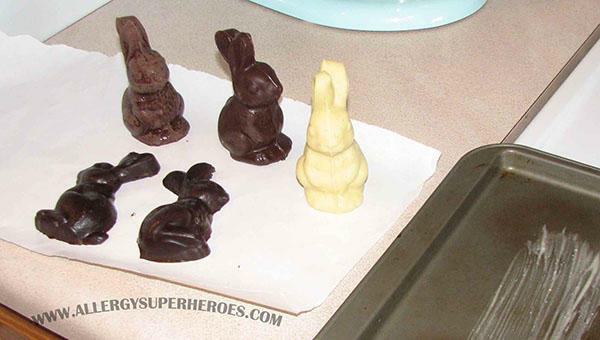 The younger they are (the bunnies, not your child), the less likely they are to bloom if you overheated your chocolate, so no need to start now unless you want to make a lot or eat all the evidence But you can go to your local hobby store or cake/candy specialty store now to buy molds and start getting excited! Once you do make them, be sure to store them somewhere coolish but not cold enough to attract condensation (basements work well for this.) Good luck! How soon in advance of Easter do you recommend making these? Thanks so much for the instructions. Can't wait to try it our for my 3 yr-old. He told me he can't wait to see what bunny comes for Easter when we passed the chocolate bunnies in the supermarket. So the pressure is on for me to deliver. And I only saw this comment now, I need to subscribe to my own blog posts. I hope you enjoyed making your own chocolates Monica, if you made them! Wonderful work, it looks yum. I really loved this. My kids would love to make these. Last week, bought some organic dark chocolates on Sarah’s birthday. Next time would love cooking out this at home.